Christians are increasingly struggling with how they are to relate to the surrounding culture. It seems hostile and designed in ways too multifarious to counts to work against any kind of consistent Christian community ethic. For that reason some have put forward the idea of the ‘Benedict Option’: a communal withdrawal from the mainstream, for the sake of sheltering one’s faith and family from corrosive modernity and cultivating a more traditional way of life. But is that really the best Christian option out there? 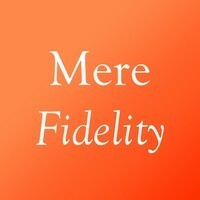 Matt, Jake Meador, Matthew Loftus, and I take up that question on this week’s Mere Fidelity. As always, feel free to rate and review, or share. The iTunes feed for Mere Fidelity is here if you’d like to subscribe (thanks to everyone who has reviewed us so kindly), and an RSS feed for the show lives here.